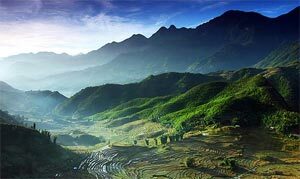 The geography of Vietnam has inspired us to create a variety of outdoor adventure packages. Our trekking tours have been recommended in many travel guides. From easy trek or off the beaten path to challenge your self, to witness the unspoiled Vietnam with all safety concerns taken into account. 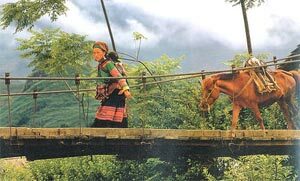 When you are trekking in Vietnam, trudge up to the Sapa highlands in the northern reaches of the country. In Vietnam, jungle trekking options are some of the most finest here. Your treks will take you through the primeval rain forests of this area, the pine and bamboo forests, past gurgling streams of crystal clear waters, plunging waterfalls and through quaint villages. Nature is at her finest here, bestowing all her good tidings on you. Vietnam is one of the most delightful places in South-East Asia, a land of spectacular mountains, valleys and primal forests, and is home to a warm-hearted, smiling and hospitable people. The striking and varied landscapes, from high rolling hills to undeveloped beaches, are a traveler's paradise and cover a wide range of climates. Whether you want a hard trekking tours to the Far North, the very top of Vietnam, Mount Fansipan or a soft hiking adventures journey around Mai Chau Valley, Cuc Phuong National Park, our team of local experts having years of experience are always there to customize together with you the most suitable trip according to your needs and your budget. There are some awesome Vietnam jungle trekking trails, quite off the beaten route too, at the Pleiku highland area of central Vietnam. Solitude and sheer natural beauty reign supreme here and the exhilarating treks will also provide you opportunities aplenty to take a sneak peek into the fascinating lifestyle, customs and traditions of the ethnic tribes dwelling here. Modern civilization is yet to encroach in these parts, and this is evident not only from the virginal beauty of the forests, but also from the lives of the residents here. The term trekking is traditionally applied to overland journeys made on foot, usually involving the support of a trek crew to carry personal belongings, along with any tents, food and cooking equipment that may be required. 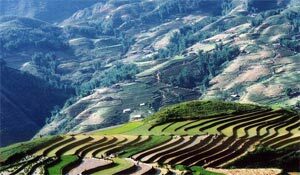 We have compiled a list of hiking and trekking tours in Vietnam. If you are interested in any of these hiking and trekking tours and vacations, please contact us directly with any questions for ordering free brochures or booking. If you are still not sure of the best place to have a trek, the most appropriate time to plan your holiday, please check all these our below sample trekking tours or to contact us.